In this tutorial, we’ll learn about clock mechanism in LPC2148. Here we’ll discuss every detail about configurations of Clock and PLL in LPC2148 ARM7 Microcontroller. There are several ways we can clock ARM Microcontroller. 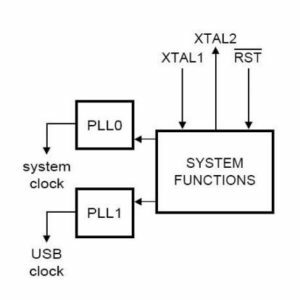 One way is to use External Clock with duty cycle 50-50 and in a frequency range 1 MHz to 50 MHz connected to XTAL1 Pin. The second way is by connecting External Crystal Oscillator but its range is lower between 1 MHz to 30 MHz. We can also use on-chip PLL Oscillator but here external clock frequency should not exceed range from 10 MHz to 25 MHz. In this tutorial, we will concentrate on External Crystal with PLL. External Clock source and External Crystal only will be discussed in future since it’s not required at this moment. What is PLL (Phase Lock Loop)? ARM7 LPC2148 Microcontroller needs two clocks; one is for its peripherals and other for its CPU. CPU works faster with higher frequencies whereas peripheral needs lower frequency to work with. 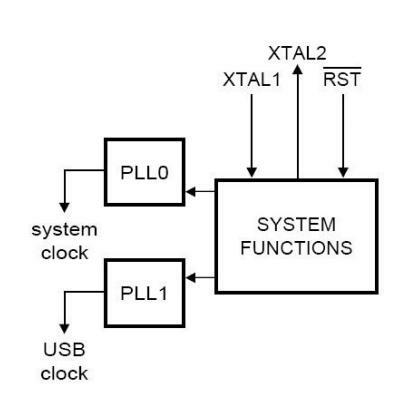 The Peripheral Clock (PCLK) and CPU Clock (CCLK) gets clock input from a PLL or from external source. After RESET, configuration of PLL (Phase Lock Loop) and VPB (VLSI Peripheral Bus) Divider would be first thing to do. PLL unit itself uses CCO (Current Controlled Oscillator) which operates in the range between 156 MHz to 320 MHz, so there is additional divider which keeps CCO within its range, while PLL provides desired frequency. Output clock is generated by dividing CCO frequency by 2, 4, 8, 16. Minimum divider is ‘2’ so output of PLL will always have duty cycle 50% for sure. VPBDIV=0x03 Reserved. If this value is written to the APBDIV register, it has no effect (the previous setting is retained). 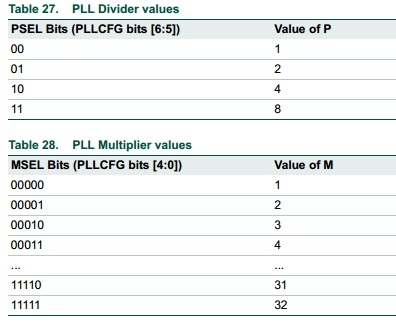 Further, there has to follow some sequence to activate PLL. After PLLCFG register is updated then update PLLCON register and then we have to write 0xAA and then 0x55 to PLLFEED register. This value has to be written in consecutive cycles. Here is an example. This is how you can configure Clock and PLL in LPC2148 ARM7 Microcontroller. In next tutorial, we’ll explore timer feature in LPC2148 ARM7 where we’ll explore the usage of PLL with an example project. If you have any question, then feel free to leave a comment. Thanks.